Adventures on the Crazy World of Minigolf Tour (and in other sports and games). A visit to the new Mini Golf course at Tea Green Golf Club in Wandon End, Luton. Tea Green Golf Club in Luton has unveiled its upgraded Mini Golf layout and on Friday I headed up there for a few rounds on the course. Emily and I have been visiting Tea Green Golf since we found out that the club was home to a Crazy Golf course in July 2009. The course was the 111th played on our Crazy World of Minigolf Tour. Since that first visit almost six years ago the courses has undergone some changes. 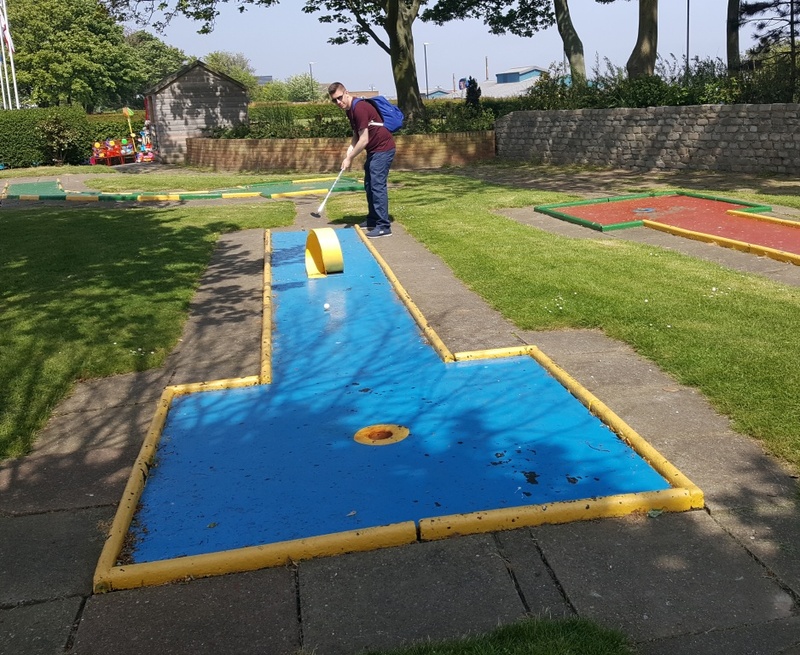 Using the base holes as a foundation for the new miniature golf layout the 9-hole course has been refurbished and freshened up with new borders, obstacles and colours. I'm very pleased to say that the course manager Lester Coles and the team have taken on-board some of my suggestions for updating the course. There are now some nice undulations on the course, bright colours, high quality felt to play on, and of course there's a windmill on one of the holes. Lester has also been a minigolf rival of mine since we first played the course in 2011 so he was itching to give me a game - and what a clash it was. Having set the record of 17(-1) on the first official day of the new course Lester bested me in the first two rounds (18 to 19), before we tied on 17. We then played another 18-hole round which saw me force a play-off with an ace at the last hole. The game continued to the 4th extra-hole before I was robbed by a bounce out from my second putt. Check out the photos of the 9-hole course below. Tea Green Golf is a really friendly golf club that welcomes members and non-members alike. The Par-3 Golf course is a great test and they also have a really popular Footgolf course. Plus there's a bar, restaurant and games area (pool and darts). Visit the Tea Green Golf website, and check out the club on Facebook and Twitter for more information. Interesting fact: the course is both in Bedfordshire and Hertfordshire!? Is Skegness as bad as Pyongyang? © Richard Gottfried 2006, 2017. Simple theme. Powered by Blogger.